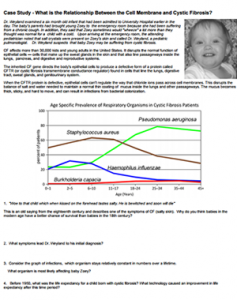 This case study explores the relationship between the cell membrane and breathing difficulties that occur as a result of the genetic disorder cystic fibrosis. Students look at specific channel proteins in the cell membrane that affect the movement of chloride ions. Different mutations result in different problems with these protein channels. Treatment options depend on the type of mutation present. This is intended for an AP Biology, and includes advanced data analysis and interpretation of graphics. Students works in small groups to solve problems and work through some of the difficult concepts presented. HHMI has a great animation of the CFTR protein and how changes in its shape result in a non-functioning channel.